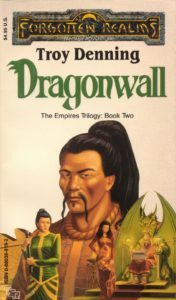 Dragonwall – Let's Read TSR! Readers didn’t have long to wait for the second installment of the Empires trilogy. Each book in the series was written by a different author; they gave this one to Troy Denning (the author of Waterdeep) so that he could work on it while David Cook was working on Horselords. This book picks off shortly after the point where the first book let off, after the Mongol Tuigan army has breached the Great Wall Dragonwall of China Shou Lung. This time, however, we’re seeing it all from the perspective of the Shou defenders instead of the Tuigan invaders. And you know what that means… it’s historical fan fiction time again! In terms of successfully portraying a fantasy counterpart to a real-world culture, this book falls somewhere in between Ironhelm and Horselords. It’s not nearly as terrible as the straightforward caricature of Aztec culture that we saw in the former, but it’s nowhere near as successful at bringing its source material to life as the latter. Frankly, it feels like someone did a considerable amount of research on Chinese history, then tried to include everything they read in their novel in a respectful but haphazard fashion. Anachronisms abound, with elements from widely disparate time periods in Chinese history crammed together into a readily-digestible slurry of Chinese culture. (I think my favourite example is women wearing modern-style cheongsams which weren’t introduced until the 1910s… but if you’re just throwing in everything that’s stereotypically Chinese, why not include the twentieth century?) Moreover, the writing which introduces the faux-Chinese culture to Western audiences is often clumsy — more on that later. The Shou make an excellent contrast to the Tuigan; their culture is lawful, regimented, and hidebound, a far cry from the savage and exuberant nomads we just spent the previous book with. Unfortunately, we see what life is like for the upper class, the mandarins and generals, but never spend much time with other parts of the culture. One aspect where it seems Denning deliberately departed from history is in the treatment of women; instead of being virtually chattel to the male heads of household, as in medieval Chinese society, they seem to have a significant degree of equality and freedom in Shou Lung. One of the women we meet is a self-made lady who’s become a high-ranking mandarin of the Emperor’s court, and is treated with the same respect and deference as any of her male counterparts; the other is a headstrong kung-fu master who chose her own husband rather than let her parents choose for her. It’s a welcome shift from the male-dominated culture in Horselords, where there was only one woman with both a name and a speaking part in the entire book. The Tuigan are invading Shou Lung, and the inflexible, short-sighted Shou bureaucracy suddenly has to find a way to deal with a couple hundred thousand bloodthirsty barbarians rampaging across their lands. The Emperor eventually settles on giving complete command of the nation’s defense to Batu Min Ho, an unconventional and unpopular general who seems to be one of the only people in the entire culture with a creative, free-thinking bent. The novel then splits into two main threads. One follows Batu’s armies as they implement his plan to repel the Tuigan horde, which involves a tremendous number of large battles where deaths in the thousands are an everyday occurrence. The point-of-view scenes for Batu and his father-in-law were good, but I found that the huge battle scenes got tiresome after a while — when the number of people involved is so vast, it becomes hard for the reader to care if a few thousand die here or there. Those scenes were more palatable from Koja’s untrained perspective than Batu’s critical eye, I think. Koja saw the entire enterprise of war as a confusing, terrifying waste of life, so Horselords focused on a smaller-scale experience of warfare as seen through his eyes. (There was even a big battle in that book which he missed entirely, confined to a tent where neither he nor the reader could see anything.) As a general, Batu’s perspective for describing battles is all about the big-picture strategy, which can be entertaining when done well but eventually starts to feel like someone reading out the play-by-play of moves in a chess game. You lose the terror and immediacy of personal involvement when you see a battle from a thousand-foot view. Still, it may be less gripping, but at least it doesn’t quite get boring. The other plot thread follows Batu’s family and various courtiers in the Emperor’s palace, where Batu’s wife has to fight for her husband’s reputation at court and a mysterious spy is leaking Shou plans to the enemy. This thread actually worked better for me — the intrigue and personal conflicts here were more entertaining than the large-scale combat and strategic movement of troops. Which, I suppose, is why the ending of this book didn’t work very well for me — this thread gets cut off about two-thirds of the way through the book, much like Batu’s wife’s head, and the rest of the book is all warfare and angst. Batu’s wife Wu, a strong-willed and independent woman, spends the novel trying to protect a secret entrusted to her by her husband and trying to discern the identity of the spy in the Emperor’s court. When she gets too close to the answer, the spy ruthlessly kills her and her two children. This gives Batu plenty of reasons to be upset for the rest of the novel, and is the main motivation behind his defection to the Tuigan once peace is re-established. Her death marks the point in the story where I started to check out, unfortunately, because Batu’s angsting and anger ultimately aren’t all that interesting. He was a more interesting character at the start of the novel, when he was balancing a web of conflicting responsibilities and trying to do his best to navigate a complex world; by the end he’s more of a bloodthirsty death seeker who’s severed all his earthly ties and lives only for combat, which is a big step down character-wise. But did she really end up in the refrigerator? This situation doesn’t seem quite as straightforward as your usual fridge-stuffing. Wu is more than just an appendage to the male protagonist; she’s a capable, independent character who’s trying to do right by both her family and her country. She dies after the failure of her high-risk attempt to steal evidence to incriminate the spy, so her death isn’t the sort of passive thing where a villain hurts her to get at the protagonist. I think of Wu as more of a deuteragonist than a plot device — she deliberately took a big gamble and lost, but her heroic sacrifice ultimately saves the country. Yes, she died, and yes, it furthers Batu’s character development, but it doesn’t quite seem like a refrigerator case to me. I found the plot structure rather odd, as well. The central “repel the barbarian invasion” plot wraps up at around the 75% mark in somewhat of an anticlimax, and then the book staggers on for another quarter in an extended denouement. Batu abandons his old life, defects to the Tuigan, adjusts to life among the horde, travels many hundreds of miles away, then battles a random army, all of it sufficiently different in tone and characterization to feel like an except from a separate book rather than the conclusion to Dragonwall. Questions of loyalty and identity are at the heart of Dragonwall. There’s the conflict between personal loyalty to people you care about versus loyalty to the state. Batu often finds himself torn between following bad orders from his superiors and the penalties for disobeying, which leads him to come up with creative solutions under fire. (In a nice bit of turnabout, he later becomes the guy responsible for giving the orders that other people think are bad, and has to convince them to follow his lead.) Wu is all about personal loyalty, by contrast, wilfully disobeying any order which she doesn’t agree with if she thinks it would benefit the people she cares for, and the consequences are disastrous. It’s a good theme. The other theme is Batu’s quest for personal identity, though it gets fairly short shrift until the very end of the novel. As a Shou with Tuigan ancestry, he doesn’t feel fully comfortable in either culture — neither the rigid order of Shou society nor the filthy barbarism of the Tuigan match his temperament, though he’s able to find success in both. This theme would have worked better if it had been set up more in the earlier parts of the book, instead of being out of focus for three-quarters of the plot and then centre stage during the very long denouement. Batu Min Ho, the Shou general who serves as our protagonist, gives us a good lesson on Shou culture by rejecting its traditional values. He’s a blunt-spoken warrior who prioritizes personal loyalty over patriotic duty, which constantly puts him at odds with the government functionaries and scheming politicians with whom he has to deal. But as mentioned above, it feels as if he gets negative character development over the course of the book; once all of his “man vs. society” and “man vs. himself” issues are resolved, he loses almost all of his connections to the rest of the characters and gets stripped down to a very simple “War is fun!” personality. Still, at least it’s an arc of some sort. His wife Wu is a stubborn, headstrong woman, a kung-fu expert who’s fiercely protective of her family. Their children are… well, they’re present. Not particulary well-developed. Together, they form the chains which keep Batu tethered to Shou society. But it’s nice to see his family play a more active role in the plot rather than just being the hostages he leaves behind; they have their own plotline for a while which has a refreshingly different tone from all the “clash of armies” stuff. Wu doesn’t get much in the way of a character development arc, what with getting killed partway through the book, but at least she gets a unique characterization and some decent motivations. We also get some insight into the labyrinthine politics of the Shou empire through the point of view of Ju-Hai Chou, the mandarin who tried to have Yamun Khahan assassinated in the previous book, and his dealings with his fellow councilors and the Emperor himself. He’s amoral but principled in his own way, and seems to be one of the only high-ranking officials who actually has the good of the empire in mind instead of his own ambition. I like the portrayal of the Emperor: neither a petulant Caligula nor a wise, all-knowing ruler, but something in between. He’s a reasonable authority figure, willing to hear people out and rejecting some blatant attempts at manipulation from his courtiers, but he’s also a stickler for protocol and sensitive to disrespect. We see Koja again, but this time from a new perspective where he’s seen as the lackey of the hated enemy. He doesn’t get much in the way of respect from the Shou who have to deal with him during diplomatic talks, which is a bit of whiplash for the reader after seeing everything through his eyes in the previous book. Poor guy. The guards wore the emperor’s yellow dragon-scale armor and held broad-bladed polearms called chiang-chuns. La Gritona. Such a funny name for such a lovely arroyo. But that’s what they called the creek that ran behind the house. See? Now you know what arroyo means even if you don’t speak Spanish, and it didn’t require any awkward immersion-breaking at all. One has to blend the cross-cultural elements in carefully, not just randomly splat them on top. The old noble pointed at the seat, which was known as a howdah. Is it? Is it really? Because last I checked, “howdah” was a Hindi word of Arabic origin, and inserting it among all the other Chinese vocabulary just sounds bizarre to the ear. He could have just called it a howdah (a word found in any dictionary) without further explanation, and it wouldn’t have been a problem. There are also some minor typos that the editor should really have caught, like “route” and “aide” where they meant “rout” and “aid”. It’s entertaining but not great. The huge battle scenes get old after a while, the writing is often clumsy, and the structure is just strange. Still, the setting work is reasonably good, the characters are fairly well-done, and I found myself I enjoying it somewhat. Not a rousing success, but I wasn’t annoyed with it.